You work hard. Whether it's in a high-rise office building, a school room full of tiny tots or at home cleaning up after your own messy brood. You deserve a purely self-indulgent treat. 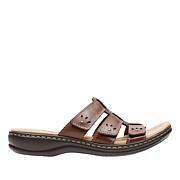 Clarks leather slingback sandals feature a molded Ortholite® footbed and Cushion Soft™ technology that caresses your feet with total luxury. Go on and indulge just this once. I bought this month and I'm very happy with my purchase! 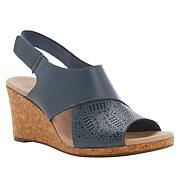 love these shoes, comfortable, cute and very versatile. Great quality too. I ordered the brown/tan and I am going to order the black. I purchased 2 pair. Heel is perfect for me. Very comfortable. Classic style. Very happy with my purchases. I take a size 8 in clarks and true to size. Fits great and the leather is so soft. Bought for my vacation so I havent worn as of yet. Big fan of Clark shoes. Fashionable with out giving up comfort. Beautiful, but had to return them because they are very heavy.